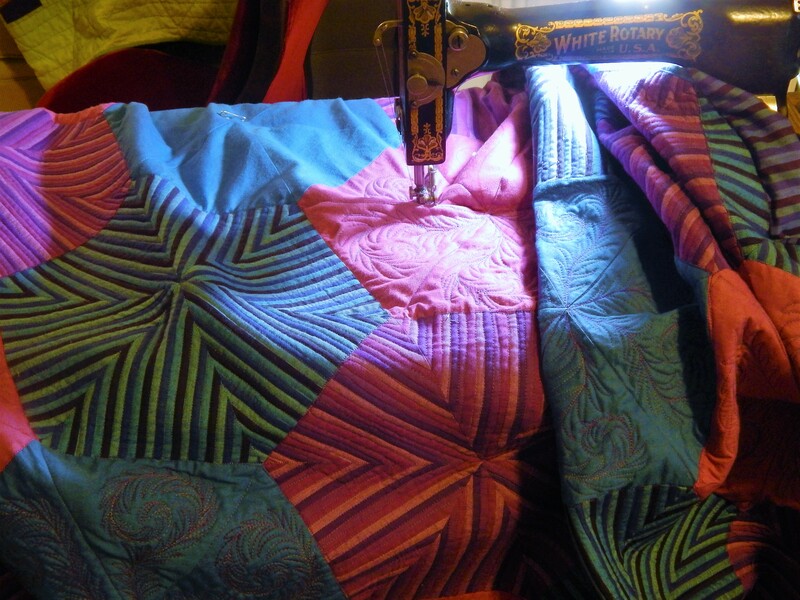 I am focusing my hand quilting attention on a great quilt. 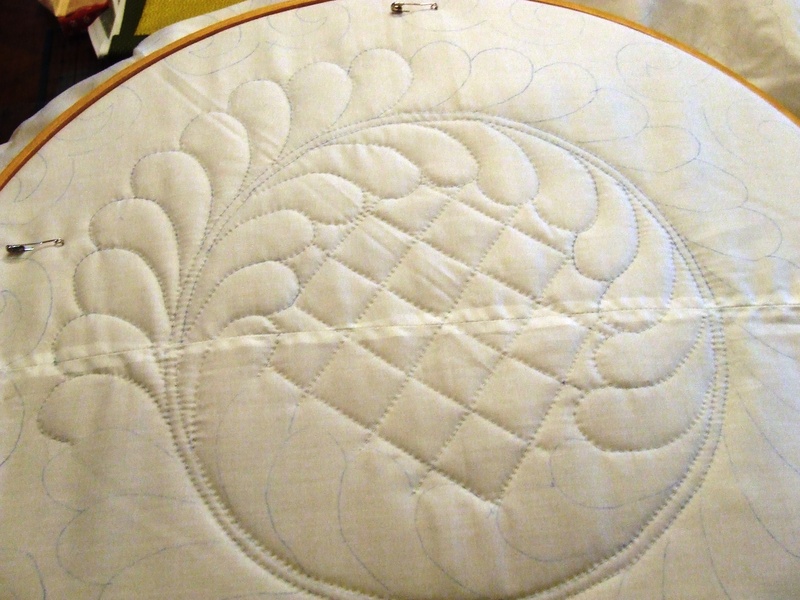 It has a lot of quilting so it won’t be done quickly. The more blocks I finish the more I am deciding that I will stuff (trapunto) the feathers between the blocks. It will really make them special. It has been snowing here. Nothing like in some parts of the country! 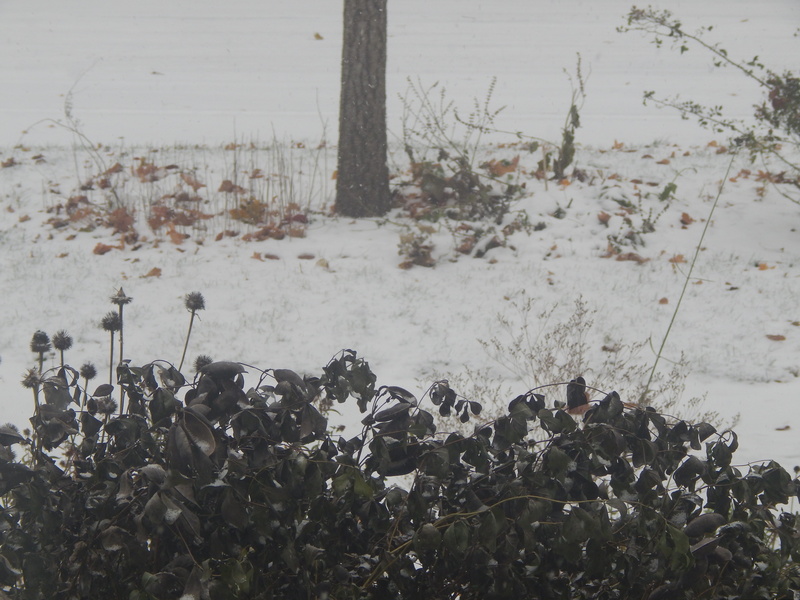 but snow enough to make it look like December rather than November. Teddy hates the snow, he wasn’t built for it and after a walk he likes to sit on my lap to warm up is cold toes. He does like to look out the window. Not much to see there, but there are some neighborhood cats that like to hide in the garden. 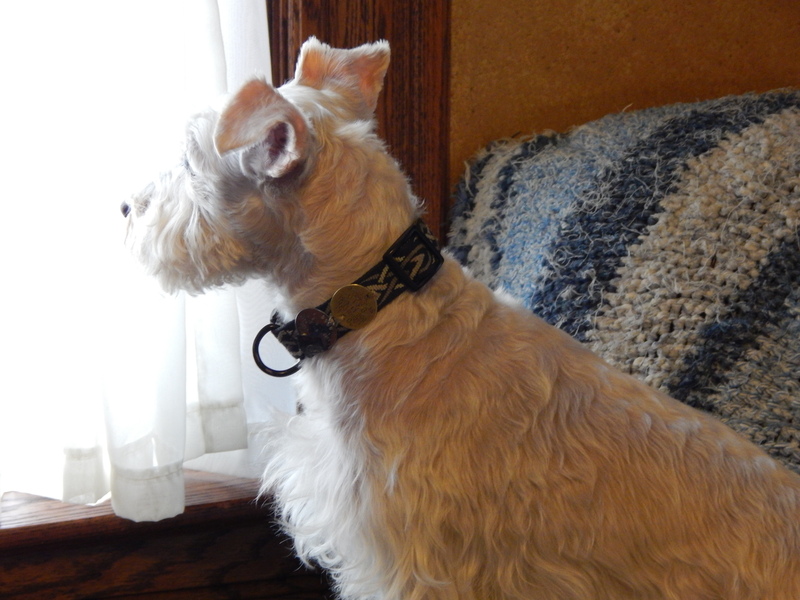 He is always on the lookout for someone who is coming to steal his bone….he is very protective of it and if he sees anyone coming down the street he goes to guard it. This is the time of year where time seems to disappear and I wonder if I am really getting anything done. Probably because I have so many things going on at once. 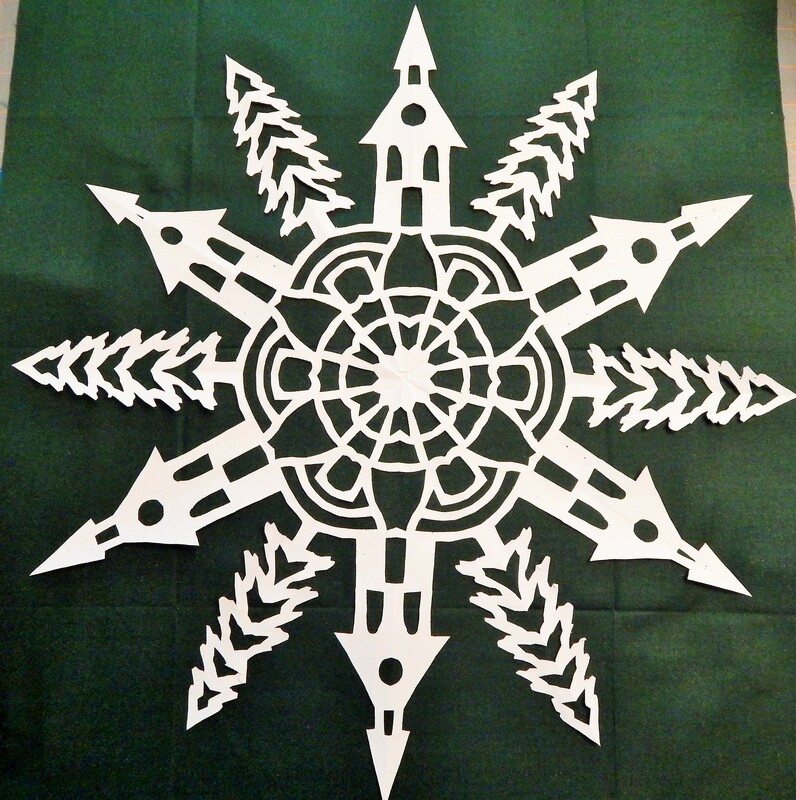 I worked on snowflake patterns/instructions and made a file of them available on my Etsy site see the link for that on the sidebar to the right of this page. I also made a snowflake and pattern that I am posting here for you as a free download. 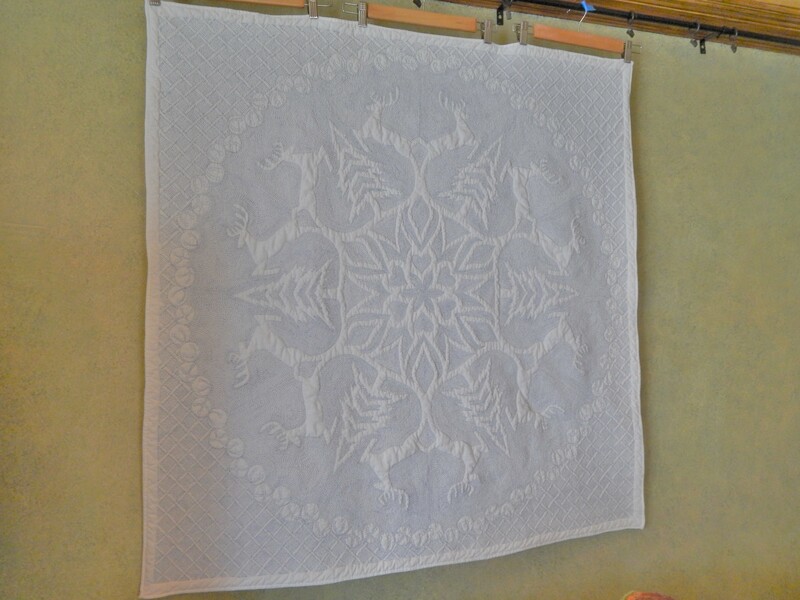 This entry was posted in ETC, Quilts and tagged hand quilting, Quilts, Snowflakes. 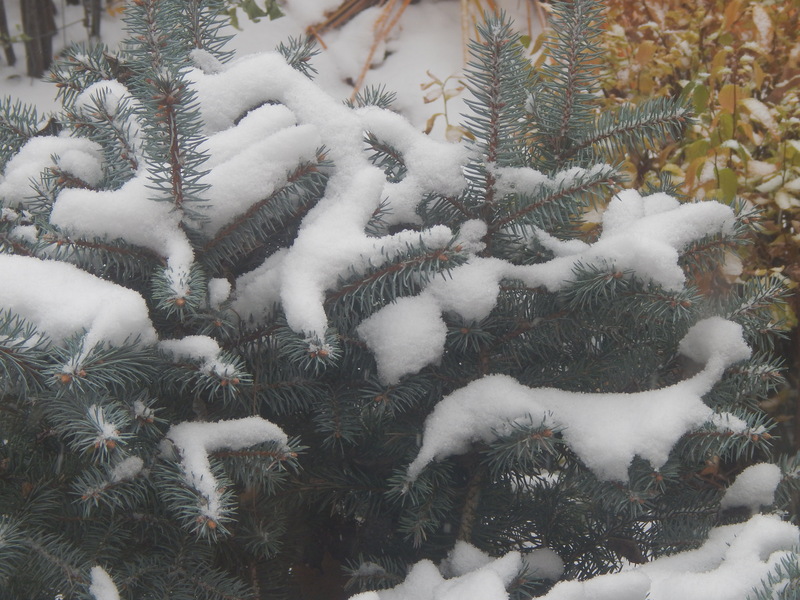 when I was a kid I loved the snow!….I still think it is very pretty….but dont like to be out in it! Maybe some of the snow here can make it to Cali in the form of rain! Tim, one of my friends has a heating pad set into a basket (covered and set on low, of course) for her pet. 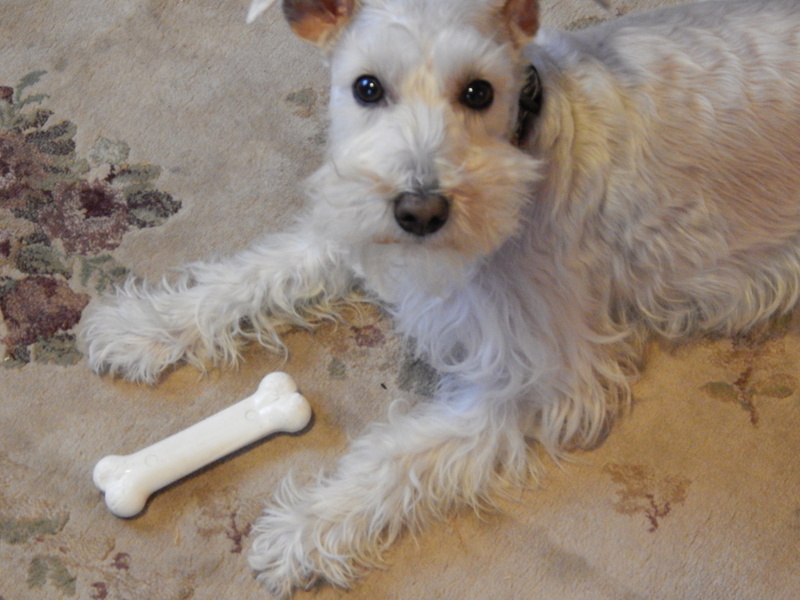 Maybe Teddy would like one to warm his toes, that is, if you don’t always have “lap-time” for him. Lovely quilts and snowflakes and cute doggy (as always), but tell me about your quilt hanging system, please. Thanks for the snowflake pattern! You can get little snowshoes for Teddy, go online and my niece has some for her dog and it keeps her feet nice and dry and warm! Tim: Beautiful designs! We haven’t had much snow here either, and I’m not complaining. We’ll all get our turns. Hi Tim, Well, passing outside of Zurich today I saw that there is quite a lot of snow up there in the Alps but luckily (in some ways) there is none down by us. I just wanted to tell you off! I was just starting (after a day of browsing through one of the few modern quilt magazines I like) starting to ‘forget’ about hand quilting. And then I see your blog post. You are so cruel!! I have been ‘studying’ my quilty books over the weekend and I came across quite a few like this, new one you are doing. Appliqué I assume. Love the colors. The flower looks really exotic. Any story behind it. Wait, I probably missed this in a previous post. But I love the echoing!!! Well done! Love your updates on Teddy!! He is so cute! Great company for those cold wintery quilty days! The top is a very old one….about 1850…..it belongs to a friend who will get it back once I finish quilting it…..I have never seen the pattern before and do not know who made the top……but it is really a super applique quilt with a great applique border……Im also starting to like the modern quilts….but this is such a great one i love working on it! 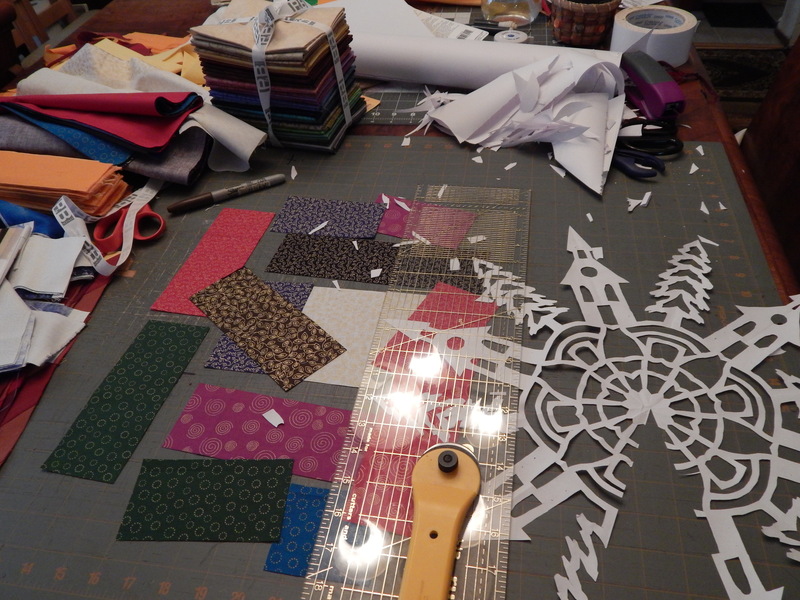 Great to hear that you’re listing your snowflake patterns! Love that quilt you’re working on. It’s wonderfully striking in a vintage/traditional way. 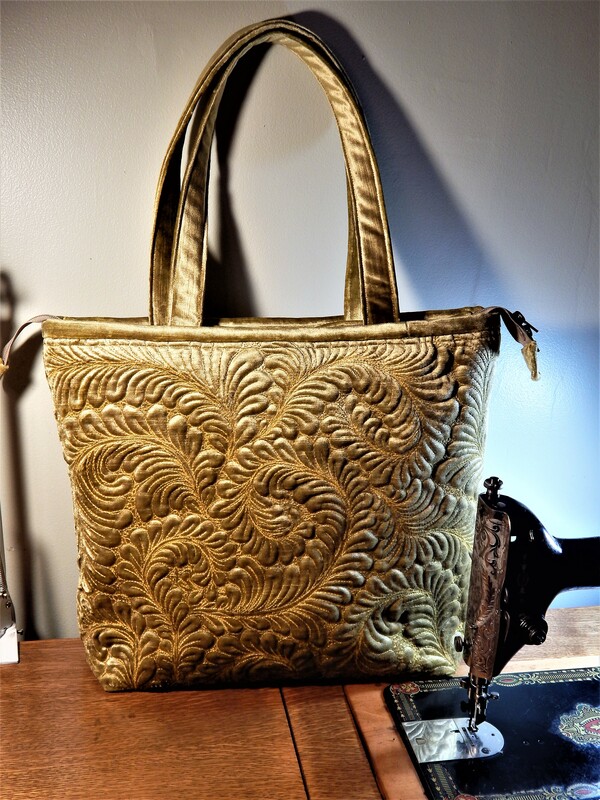 Your stitching is taking it to a whole new level of amazing already. I’m at my daughter’s with her family on the West Coast. Although it’s raining today it’s not as cold as where you are. Going home next month so I’ll see how it is for sure. The Carolinas get some very cold weather too. Maybe if you could stitch some suspenders to the bottom of Teddy’s coat and clip the suspensers to each little bootie he can’t pull them off. You know if you put a muzzle on him until you get them on and get him outside for a time or two he will probably understand that they will keep his feet warm☺. Take the muzzle off once he’s outside. He’s smart I think he’ll get it. But I love that heating pad idea. I think Teddy would like that new idea too. Let us know! 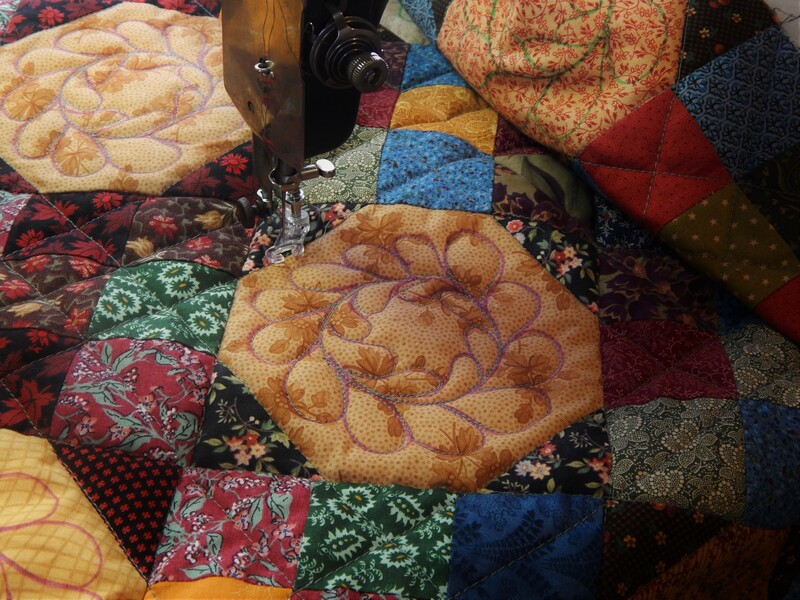 Beautiful old quilt you are working on. I think I need to hand quilt tonight. I’ve got one going. Happy day. I laughed at the stories about Teddy. He’s a class act. Too bad about his past. But, he is loved by you and all of us. Thank you soooo much for the snowflake pattern. Ttyl. Have a good day. BTW, if you move to California, come to Los Angeles. Temp today is 69 degrees. I would love to see you and Teddy in person. Give him a hug for me. Love that table! Creative people have organized messes! 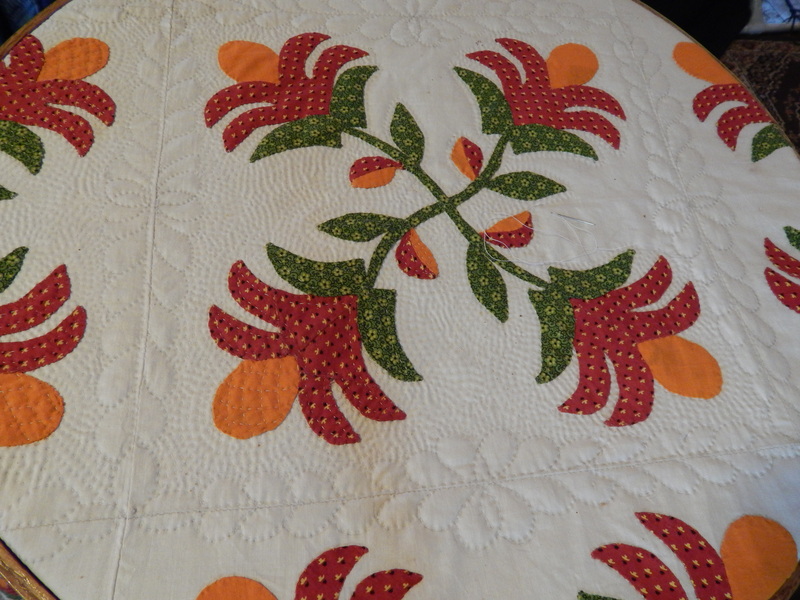 That quilt is so lovely, and even more so as I hate to do applique. Lucky you and Teddy enjoying lovely snow. We’re here in Nevada and would almost kill for some snow this year (fingers are crossed!) Your quilting is outstanding as usual – love your creativity and talent!!! Your hand quilting is amazing! Woohoo! My favorite quilt ever! But I would say that, wouldn’t I? But it’s good that you’re feel able to work on it again — plenty to keep you busy warm inside. At least you didn’t get the five feet of snow they got in upstate New York (we got none down in New York City). I’m with Teddy, rain booties annoy me too. its a great one to work on! slow but very rewarding! Thank you, Tim, for the pattern. I’m waiting for my wool batt to arrive and then, stand back! We’re off and running on Megan’s quilt. Well, after I finish three more quilts for Christmas and a needle case for a friend at work and…well, you get the picture. And thanks for taking care of Teddy. You know how our adopted dogs and cats are so grateful to us for their warm, safe homes. I’m sure he would like it there (so would I) from the pictures I have seen it sure looks beautiful….. I am sure he would (I would as well!) from the pictures I have seen It look like a beautiful place ! This is a gorgeous quilt and your stitches are really taking it over the top! I hope to do something similar on my applique quilt. Your applique is beautiful! I am so glad this was done for me!